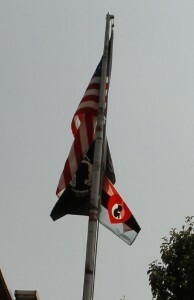 The American Flag, the POW-MIA Flag and the Flag of Life over Nyack Town Hall in July 2010. The Rockland County Catholic Coalition was founded in 1989 with the intention to publicly affirm our rights as American citizens to speak out as Catholics and peacefully dedicate our efforts to seek the truth, especially in what concerns God and his Church. Knowing that “the absence of God leads to the decline of man and of humanity.” The Rockland County Catholic Coalition will peacefully defend and promote the common good of civil society. ensure equal opportunity for all, including public officials to peacefully act upon their moral convictions in the public sphere. To contact the Rockland County Catholic Coalition e-mail us at: rccatholiccoalition@gmail.com . The Rockland County Catholic Coalition is also on Twitter at: @rrcatholic – so follow us there! Immaculate Conception – Stony Pt.